This box was designed to accomodate cards and letters for the bride and groom. The top is accented with bands of Cardinalwood and Curly Maple, which are defined with edges of black-stained veneer. Sides are solid 1/2" (13mm) thick Black Walnut. 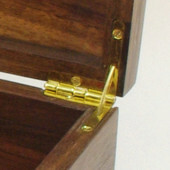 Top was made from solid woods into an assembly about 1/2" (13 mm) thick. It was then re-sawn into two pieces about 1/8" (3mm) thick which are laminated to both sides of 1/4" (6 mm) plywood. This construction not only makes the interior of the top as attractive as the exterior, but also prevents warping of the top. Interior is lined with a luxurious burgundy faux-suede.